Greek: Kai dia touto diathekes kaines mesites estin, (3PAI) opos thanatou genomenou (AMPMSG) eis apolutrosin ton epi te prote diatheke parabaseon ten epaggelian labosin (3PAAS) oi keklemenoi (RPPMPN) tes aioniou kleronomias. Wuest: And because of this, of a testament new in quality He is mediator, in order that a death having taken place for the redemption of the transgressions under the first testament, those who have been divinely summoned [into salvation] might receive the promise of the eternal inheritance. For this reason - When you see this term of explanation, pause and ponder it, eg, asking "What reason?" Why is Christ the Mediator of a New Covenant? The writer refers to Messiah's efficacious offering and cleansing from sin so that the believer might worship the living God. Vine adds that "it is owing to the necessity of such a sacrifice as Christ offered, an offering which could put away sin and transgressions and cleanse the conscience, that He is the Mediator of the new covenant." Spurgeon - It was absolutely needful that guilt should be atoned for, and, therefore, Jesus became a mediator. Nothing short of this could secure the eternal inheritance for those who are called. Take away the atonement and you have robbed our Lord of His greatest reason for being a mediator at all. We love and live upon the truth of His atoning death. new covenant Whether it be a covenant or a testament, death is necessary to make it valid. God’s covenants have ever been sanctioned and ratified with blood, and the covenant or the testament of eternal grace is ratified with the blood of the Surety and Testator. Mediator (3316) (mesites [word study] from mésos = middle, in midst) is one who stands in the middle between two people and brings them together. It is basically a neutral and trusted person in middle (mesos), a so called "middle Man". It is one who works to remove disagreement and thus a mediator, go-between or reconciler. In short, Jesus is the Mediator, the One Who stands between men and God to bring them together. NET Note -The Greek word mesitēs, “mediator” in this context does not imply that Jesus was a mediator in the contemporary sense of the word, i.e., he worked for compromise between opposing parties. Here the term describes his function as the one who was used by God to enact a new covenant which established a new relationship between God and his people, but entirely on God's terms. Covenant (1242) (diatheke from dia = two + tithemi = to place) pictures that which is placed between two and thus a covenant is something placed between two, an arrangement between two parties. Diatheke speaks of an irrevocable decision which cannot be cancelled by anyone. Diatheke was a commonly used in the Greco-Roman world to define a legal transaction in settling an inheritance and would correspond with our modern term of a "final will and testament" which defines how that which belongs to the owner (the one who makes the will) will be divided among the heirs. Obviously a prerequisite of its effective disposal requires the death of the disposer. In reference to the divine covenants, such as the Abrahamic covenant, diatheke is not a covenant in the sense that God came to an agreement with fallen man as if they were signing a contract. To the contrary, when God entered a diatheke with Abraham it involved His declaration of His unconditional promise to make Abraham and his seed the recipients of the covenant blessings. The truth of a suffering Messiah has always been a "scandal" to the Jews, for as Paul declared "we preach Christ crucified, to Jews a stumbling block, and to Gentiles foolishness (1Cor 1:23)." Redemption (629) (apolutrosis [word study] from apo = marker of dissociation or separation + lutroo = to redeem <> from lutron = ransom <> from lúo = loosen what is bound, loose any person tied or fastened) is the payment of a price to ransom (lutron = money for a ransom = ransom or price paid for a slave who is then set free by the one who bought him), to release (of someone from the power of someone else) on payment of the ransom price, to buy back or to deliver one from a situation from in which one is powerless to liberate themselves from or for which the penalty was so costly that they could never hope to pay the ransom price. In other words, the idea of redemption is deliverance or release by payment of a ransom. Apolutrosis - 10x in 10v - Luke 21:28; Rom 3:24; 8:23; 1 Cor 1:30; Eph 1:7, 14; 4:30; Col 1:14; Heb 9:15; 11:35. NAS = redemption(9), release(1). From Ep 1:7 (note) and Col 1:14 (note) we have a wonderful "definition" (or association) of redemption as that which effects the forgiveness of sins - sin incurs a debt payable only by death = blood (Lev 17:11, 1Pe 1:18, 19-note)] & Jesus paid the price in full Jn 19:30 ["It is finished" = verb tetelestai in perfect tense = "Paid in full" with perfect tense speaking of the enduring quality of the payment = the debt is cancelled completely and forever!]). As discussed more below this full payment would also take care of any sins committed under the Law. 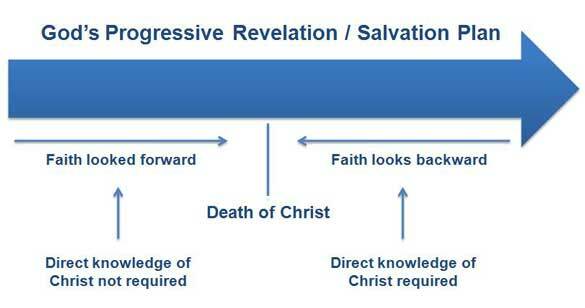 See the full article from Gotquestions - What is progressive revelation as it relates to salvation? God passed over the sins of Old Covenant saints those who lived before the Cross. God was satisfied when a man in the OT put his faith the Messiah as did Abraham (Ge 15:6, Gal 3:8). Because Christ's blood was not shed until hundreds or thousands of years after many Old Testament believers died, their salvation was as stated, so to speak, on credit. God was forbearing and patient, (Ro 2:4-note) until the true perfect sacrifice was made. However, up until that time whenever God saw a heart of genuine faith in an OT man or woman, He passed over their sins. In a deeper sense, the sacrifice had already been made in God’s mind long before it was made in human history, because Christ’s works were finished from the foundation of the world (He 4:3-note; cf. 1Pe 1:19, 20-see notes 1Pe 1:19; 20; Re 13:8-note). From the human perspective, however, the Old Testament saints could only look forward to salvation. And so you may be asking "Why the OT sacrifices? What effect did they have if they could not make a person righteous?" This is not the full answer, but clearly the Old Testament sacrifices were never prescribed as a means of salvation, but only as markers of faithful obedience and as symbols (signs) pointing to the one perfect sacrifice that would be the true means of salvation, so great a salvation! Transgressions (3847) (parabasis from para = beyond, aside + baino = step) means to step on one side and thus is primarily a going aside, a stepping across a line, an overstepping or stepping over and always implies a breach of law and especially of the Law of Moses. It refers to the act of a person stepping beyond a fixed limit into forbidden territory. The point is that the law draws the line that should not be crossed or "stepped over". Where there is no law, people do not deliberately disobey God but they disobey in ignorance. And so parabasis is literally a going over, an overstepping and figuratively a transgression, a disregarding, a violating. It represents the act of deviating from a definite or established boundary or norm. Parabasis - 7x in 7v - breaking(1), offense(1), transgression(2), transgressions(2), violation(1). Ro 2:23; 4:15; 5:14; Gal 3:19; 1Ti 2:14; Heb 2:2; 9:15. Under the first covenant - A T Robertson writes that "Here there is a definite statement that the real value in the typical sacrifices under the Old Testament system was in the realization in the death of Christ. It is Christ's death that gives worth to the types that pointed to Him. So then the atoning sacrifice of Christ is the basis of the salvation of all who are saved before the Cross and since." Those who have been called - Who are the called? These are the "heirs" of the new covenant. As the term the called is used by the writer of Hebrews and by Paul Jude and John, it refers to those who have heard the Gospel and responded by exercising saving faith. In this understanding "the called" are virtually synonymous with "the elect". Theologians refer to this as the effectual call. Be aware that Matthew uses the term called (kletos) slightly differently than it is used in the epistles. In a parable Jesus said many were "called" to the "wedding feast" but few were "chosen" (Mt 22:1-13,14). In this context the term "call" is clearly not synonymous with an "effectual call" to salvation. Called (2564) (kaleo) speak to another in order to bring them nearer, either physically or in a personal relationship. Kaleo has several different nuances of meaning depending on the context and here clearly refers to God's (effectual) invitation to salvation. Called is in the perfect tense which speaks of an action completed in past with present continuing effects/benefits. Literally this reads “the ones having been called” and looks back to those under the Old Covenant who were called to salvation by God on the basis of the sacrifice of Jesus Christ to come long after most of them had died. The reference, as always in the NT epistles, is to the effectual calling related to salvation (He 3:1-note), which in this context refers to OT believers. Even those in the OT who sinned under the Law but believed in the Promise of Messiah, now were set free even from Abraham's bosom in Sheol (see Lk 16:19, 20, 21, 22, 23, 24, 25, 26, 27, 28, 29, 30, 31) and were taken to Heaven to be present with their Messiah and receive their inheritance (Ep 4:8-note). Promise (1860) (epaggelia/epangelia from epí = intensifies verbal meaning + aggéllo = to tell, declare) originally referred to an announcement or declaration (especially of a favorable message) but in later Greek came to mean a declaration to do something with the implication of obligation to carry out what is stated (thus a promise or pledge). Epaggelia was primarily a legal term denoting summons, a promise to do or give something, but in the NT speaks primarily of the promises of God, and Hebrews 9:15 refers to "the" (definite article in Greek conveys the sense of the specific) promise of salvation in the New Covenant which was made available by the blood of Christ, the Messiah. May receive the promise - Robertson writes that this refers to "God's purpose in the rites and symbols." Barnes - That is, the fulfilment of the promise; or that they might be made partakers of eternal blessings. That blood is effectual alike to save those under the ancient covenant and the new-so that they will be saved in the same manner, and unite in the same song of redeeming love. The eternal inheritance - Speaks of salvation in its fullness and "foreverness!" (He 6:12-note; 1Pe 1:3,4-note; 1Pe 1:5-note). Praise God that all of His promises are "yea and amen" in Jesus, the Covenant Messenger and Mediator of the New Covenant, a forever covenant. Spurgeon - When you come to deal with Christ, you have to do with eternal things. There is nothing temporary about Him, or about His work. It is eternal redemption that He has obtained for us, it is an “eternal inheritance” that He has purchased for us. Inheritance (2817)(kleronomia [word study] from kleros = lot + némo = give or distribute) is literally that which is distributed by lot and so refers to a portion which one receives by lot in a general distribution and then, in a more general sense means to possess oneself of, to receive as one's own, to obtain. In other words it can refer to property already received as well as that which is expected. Although kleronomia is an inheritance which one receives by lot, in the NT the idea of chance associated with the lot is not found. Here the inheritance is based on a promise from the "non-lying" God and thus it is trustworthy. To the Jews who were "waffling", the point was clear that they could "stake their life" on the promise of this inheritance! And so can we dear reader. All praise to God Who is not a man that He can lie. Eternal (166) (aionios from aion) means perpetual eternal, everlasting, without beginning or end (as of God), that which is always. Eternal is a key word Hebrews: blood of eternal covenant (He 13:20-note). He offered Himself through His eternal spirit (He 9:14-note) and has become the Author/Source of eternal salvation (He 5:9-note). He has obtained eternal redemption (He 9:12-note) and enables men to receive of the eternal inheritance (He 9:15-note; He 13:20-note). A Good Will - God … has begotten us again to a living hope through the resurrection of Jesus Christ. —1 Peter 1:3 - Perhaps you know someone who didn't receive the inheritance intended by a parent because of a faulty will. In an article titled "Money & The Law," attorney Jim Flynn says that if you want your estate to go to your chosen recipients instead of to members of the legal profession, you should avoid do-it-yourself wills. Such documents are usually legal but they are often unclear and fail to make provisions for unforeseen situations. Flynn advises having a formal will to be sure your wishes are carried out. The Christian's inheritance is guaranteed forever! "You come to my school in Chicago, and God will provide the funds." "You come to Christ, and He will provide the necessary payment for your sins." This is the "will" or covenant that Jesus has mediated for us. Its wonderful provisions are in force because the One who drew up the will died to put it into effect. Although a covenant and a will are not exactly the same, the "outcome" is the same. Christ's death provided "the promised eternal inheritance" (Hebrews 9:15) to all of those who are called by His name and who are His heirs. This inheritance is salvation in all of its fullness--past, present, and future. Once again, Moses and the ""first covenant"" he received from God are set in contrast to what we have in Christ. We have been told that the Law's endless sacrifices could never deal with sin once and for all. Here we are reminded of the reason for that inability. The blood offered under the old system was the "blood of calves" (Hebrews 9:19) and other animals that could never take away sin once and for all, but cover it only temporarily. It was necessary that another blood sacrifice be made, since God requires that blood be the means of atoning for sin and providing the forgiveness that sinful people need so desperately (Hebrews 9:22). Jesus' death fulfilled these requirements perfectly and permanently. His death put His ""will"" in force, so that those who are trusting in Him can receive everything promised both in this life and in the age to come when Jesus appears a second time. TODAY ALONG THE WAY - It's hard to imagine a greater blessing than knowing that we can look forward to Christ's return, not with ""a fearful expectation of judgment"" (Heb. 10:27) but as heirs receiving an inheritance! CEV: In fact, making an agreement of this kind is like writing a will. This is because the one who makes the will must die before it is of any use. ESV: For where a will is involved, the death of the one who made it must be established. GWT: In order for a will to take effect, it must be shown that the one who made it has died. KJV: For where a testament is, there must also of necessity be the death of the testator. Weymouth: For where there is a legal 'will,' there must also be a death brought forward in evidence—the death of him who made it. In Heb 9:16, 17, the writer is explaining how the believer's inheritance is obtained. Just as with any other inheritance, it is conveyed upon the death of the the one who wrote the will. And since Jesus has died, His will (testament, covenant) is now in force which makes possible eternal life and all its accompanying blessings. Covenant (1242) (diatheke from dia = two + tithemi = to place pictures that which is placed between two -- a covenant is something placed between two, an arrangement between two parties) was a commonly used in the Greco-Roman world to define a legal transaction in settling an inheritance and thus would equate with our modern day concept of a will or testament (as in someone's "last will and testament"). Diatheke generally denoted a transaction that was irrevocable could not be cancelled by anyone. As discussed more fully below, a will does not come into effect until the one who made the will dies. It is not until the testator's death that the benefits and provisions of the will become reality. Prior to the testator's death, the stipulations in the will are only promises. Necessity (318)(anagke [word study] from ana = up, again, back, renewal, repetition, intensity, reversal + agkale = arm when bent or agcho = to compress, press tight) refers to any necessity or compulsion, outer or inner, brought on by a variety of circumstances. It can mean necessity imposed either by external conditions or by the law of duty. Anagke - 17x in 17v - Matt 18:7; Luke 14:18; 21:23; Rom 13:5; 1 Cor 7:26, 37; 9:16; 2 Cor 6:4; 9:7; 12:10; 1 Thess 3:7; Philemon 1:14; Heb 7:12, 27; 9:16, 23; Jude 1:3. NAS = compulsion(3), constraint(1), distress(3), distresses(1), hardships(1), inevitable(1), necessary(2), necessity(3), need(2), obliged*(1). Must of necessity be the death - The writer emphasizes the objective necessity of the Lord's death for undoubtedly some in his readers have a doubt or question about why the Messiah had to die. Although not all covenants require death on the part of the one making the covenant before the covenant comes into force, the particular type of covenant involved in a will does, and this is the type of covenant in view here. As we have alluded to earlier, it is clear that Christ's sinless life qualified Him to be the perfect, fully satisfactory sacrifice for sin, but it was His death that made the payment for sin. The first covenant made by God with man (at least first actually called covenant) was the unconditional covenant made with Noah after the flood (Ge 9:9,11,12,13, 15,16,17) following the sacrifice of clean animals when they came out of the ark (Ge 8:20,21,9:9). Similarly, His unconditional covenant with Abraham was associated with a sacrifice of five animals (Ge 15:9,10,17,18). When God gave the law to Israel on Mount Sinai, He made a conditional covenant (dependent on obedience) with them (Ex 19:5,6) and this was accompanied by burnt offerings and peace offerings and the sprinkling of "the blood of the covenant" (Ex 24:5, 6, 7, 8). However, all of these offerings of animals were only temporal and served to prefigure about the eternal offering of the blood of Christ and the new covenant. Note that in each the aforementioned covenants made by God with man, death was associated with bringing them into operation. In that sense both the Mosaic covenant and New Covenant were "testaments" or wills. For this reason, the translators (NASB retains the word "covenant", but almost every other version uses will or testament - see technical note by Vincent) appropriately used this word will or testament under these circumstances. The purpose of the writer in using the illustration of a will that is not effective until the death of the testator is to teach the readers that the death of Christ is a necessity in order that the New Covenant (the new "will") might become effective and efficacious. Spurgeon - The covenant was not in force in the olden times until there had been a sacrifice to confirm it, and a will does not stand until the death of the testator has been proved to make it valid. The heart’s blood of Jesus is, as it were, the establishment of His last will and testament. Jesus, the great testator, has died, has made an end of sin, and His blood is the great seal of His testament, and makes it valid to us. Jesus has made His testament in the character of a sin-atoning sacrifice, and we can only share in it by regarding Him under that character. If I am not a sinner, I have no interest in the legacy of a bleeding Redeemer. The blood-mark proves that the testament was made for those who need atonement by blood, and that its legacies are bequeathed to sinners. This is one of the most humbling and yet most blessed of all truths. It casts down, and yet lifts up. If I have any grace or any covenant blessing, it did not come to me because I was heir to it by nature, or because I had purchased it, or because of any right intrinsic in myself, but because Jesus, when He died, had a right to make His will as He pleased, and He so made it that He would give Himself and all that He had to such a poor, needy, empty, lost, and guilty sinner as I am. Not because of any good in us do these blessings come to us, but all of our Lord’s good will who made the testament of love and sealed it with His heart’s blood. Since the time of Christ, people have stumbled over the doctrine that Christ had to shed His blood to atone for our sins. When Jesus announced to the twelve that He had to go to Jerusalem where He would suffer and die, the apostle Peter rebuked Him, saying, “God forbid it, Lord! This should never happen to You!” (Matt. 16:21, 22). The apostle Paul wrote, “For the word of the cross is foolishness to those who are perishing….” He went on to say, “but we preach Christ crucified, to Jews a stumbling block and to Gentiles foolishness, but to those who are the called, both Jews and Greeks, Christ the power of God and the wisdom of God” (1Cor 1:18, 23, 24). Liberal theologians hate the idea of Christ’s blood paying for our sins. They have called such views “slaughterhouse religion.” They ridicule Christians who believe in a God who would be petty enough to be angry over our sins, and pagan enough to be appeased by blood. The playwright, George Bernard Shaw, bitterly attacked the Anglican Book of Common Prayer, saying, “It is saturated with the ancient-and to me quite infernal-superstition of atonement by blood sacrifice, which I believe Christianity must completely get rid of, if it is to survive among thoughtful people” (cited in “Our Daily Bread,” 8/79). But from the start of human history, God has made it plain that forgiveness of sins is only possible through the shed blood of an acceptable substitute. When Adam and Eve sinned, they became aware of their own nakedness and sewed fig leaves together to try to cover their guilt and shame. But God did not accept their approach. Instead, He clothed the guilty couple with the skin of a slaughtered animal (Ge 3:21). In so doing, God demonstrated in a graphic way the horrific penalty of sin, but also His great mercy in providing an acceptable substitute. God no doubt explained to Adam and Eve and their children the type of sacrifices that He would accept. Abel obeyed God by bringing a sacrifice from his flock, but Cain presented to God an offering from the fruit of the ground. God had regard for Abel’s offering, but He had no regard for Cain’s offering (Gen. 4:3-5). In anger, Cain murdered his brother. And in his pride and rebellion, Cain became the father of those who hate God’s ordained way of forgiveness through the shedding of blood. Pagan religions have always practiced appeasing the gods or spirits through blood sacrifices. Sometimes they have even gone so far as to offer human sacrifices, including their own children. But we would be mistaken to think that the Jews adopted their sacrificial system by copying the pagans. Rather, as John Calvin pointed out, “all the heathen sacrifices were corruptions, which had derived their origin from the institutions of God” (Calvin's Commentaries [Baker reprint], on He 9:16, p. 209). Forgiveness of sins comes only through the blood of Christ. 1. Everyone needs forgiveness of sins because our sins have alienated us from God. As I said last week (see Hebrews 9:1-14 God's Remedy for Guilt), you can deny guilt and become hardened to the point that your conscience no longer bothers you, but if God is holy and if you have violated His holy standards, you stand legally guilty in His courtroom. So the main issue with guilt is not just guilty feelings, but actual forensic liability. If God condemns you in the day of judgment, your guilt becomes eternal. God’s de-creed final penalty for sin is eternal separation from Him in the lake of fire (called “the second death,” Re 20:14-note; see also Births, Deaths, and Resurrections). Sinners usually deny their need for God’s forgiveness by diminishing the holiness and justice of God and by magnifying their own goodness or merits. They wrongly think, “Surely God is love, and a loving God wouldn’t send a good person like me to hell.” But the Bible is clear that God is absolutely holy and just. He will punish all sin. His love does not mean that He sets aside His holiness or His justice. The Bible is also clear that we are far more sinful in God’s presence than we ever imagined. We are born alienated from God because Adam’s guilt was imputed to us. We quickly added our own sins to Adam’s guilt! We incurred guilt by violating God’s holy standards, both by our deeds and thoughts. Being alienated from God, we need a mediator to reconcile us to Him. Jesus Christ is the only mediator between God and man (1Ti 2:5). “He is the mediator of a new covenant” (Heb. 9:15). If you have ever been involved in a legal dispute, a mediator may help the two sides come to a satisfactory agreement. He listens to the terms of both sides and tries to work out a solution. Christ knew God’s absolute holiness. He also knew man’s enormous debt of sin. He took on human flesh, lived in complete conformity to God’s holy standards, and then offered Himself as the price of redemption that God’s justice demands. In so doing, He brought both sides together (see 2Co 5:18, 19, 20, 21). But He was pierced through for our transgressions, He was crushed for our iniquities; the chastening for our well-being fell upon Him, and by His scourging we are healed. All of us like sheep have gone astray, each of us has turned to his own way; but the Lord has caused the iniquity of us all to fall on Him…. As a result of the anguish of His soul, He will see it and be satisfied; by His knowledge the Righteous One, My Servant, will justify the many, as He will bear their iniquities. The fact that everyone is a sinner in need of God’s forgiveness means that you can offer the gospel to every person knowing that it is the power of God to salvation to everyone who believes. You may feel intimidated because the person you’re talking to is highly educated and intelligent. He may launch off into philosophy or science to try to prove that there is no God. Don’t be threatened. Just keep in mind that this guy is a sinner who is going to die and stand before a holy God. He needs a mediator to reconcile him to God before that day. Jesus Christ is the only such mediator. His shed blood is the price of redemption for sinners who trust in Him. 2. God’s uniform method for the forgiveness of sins has been the shedding of blood. A. Sin leads to physical and spiritual death. God told Adam and Eve that in the day that they ate of the tree of the knowledge of good and evil, they would surely die (Ge 2:17). But they ate of the fruit and did not drop dead that day. Why not? At the moment that they ate of the fruit, they died spiritually. Previously, they had enjoyed intimate fellowship with God, with no barriers between them. But instantly they were alienated from Him and tried to hide themselves from His holy presence. On that same day, the process of physical death set in. Al-though in God’s providence and purpose, those early humans lived for hundreds of years, they all died. Their bodies became subject to aging and disease. Sin resulted in death through murder and war. All of the ugly horrors of the world, whether the ravages of disease, the atrocities of crime, terrorism, and war, or the environmental devastation of the world’s resources, are the result of sin. When I have read stories about missionaries going into savage tribes with the gospel, I have marveled that these tribes had not annihilated themselves centuries before. Their histories are one long account of one tribe wronging the other tribe, and then that tribe taking revenge in brutal ways. Then the other tribe retaliates and the cycle goes on and on. The same thing is true, however, in more “civilized” parts of the world. The entire history of the world is a history of battles over territory or resources. Proud men lord it over other proud men, until they are overthrown. Sin is at the root of all of the physical death in the world. And sin results in every person being spiritually dead, alienated from the life of God. B. Blood graphically pictures the costliness of sin. The word blood occurs six times in Hebrews 9:18, 19, 20, 21, 22, plus death or dead three times in Hebrews 9:15-17. Have you ever thought about how gory and messy the Jewish religion was? Everything was sprinkled with blood. The priests slaughtered dozens and sometimes hundreds or thousands of animals at the altar. They took bowls full of blood and sprinkled it on the altar. The carcasses were burned on the altar, so that the smell would have been constant and overwhelming. I’ve never seen the slaughter of a bull or sheep or goat. I buy my meat pre-cut and shrink-wrapped in cellophane at the grocery store. To be transported back in time and witness the sacrifices at the tabernacle would be a shocking experience for most of us. The blood graphically pictured the cost of sin. C. The old covenant was inaugurated with blood, because death is God’s decreed penalty for sin. The author mentions details in He 9:19 (note) that are not included in the account in Exodus 24. There is no mention there of goats, water, scarlet wool, hyssop, or the sprinkling of the book. Other texts mention some of these things in other rituals (Lev 1:10; 14:4, 5, 6; Nu 19:6, 18). Either the author is collectively gathering up all of these rituals into one, since he is dealing with the general subject of all things in the Old Testament being cleansed by blood (so Calvin and John Owen). Or, he may be relying on oral tradition, with which all of the Jews were familiar. But, his point is, “according to the Law, one may almost say, all things are cleansed with blood” (He 9:22-note). The exception was that a poor man could offer a grain offering instead of an animal sacrifice (Lev 5:11, 12, 13). But the exception did not negate the rule, that “without the shedding of blood there is no forgiveness.” God was making the point that death is His decreed penalty for our sins. Thus every person needs forgiveness of sins. God’s uniform method for the forgiveness of sins has been the shedding of blood. 3. The death of Jesus inaugurated the new covenant with blood. Jesus’ blood, of course, is a figure of speech referring to His death. While Jesus’ physical sufferings were bloody and awful, it was what He went through spiritually that redeemed us from the curse of the Law. As Paul put it, “He made Him who knew no sin to be sin on our behalf, so that we might become the righteousness of God in Him” (2Cor. 5:21). Christ’s worst agony on the cross was to be separated from the Father as He bore our punishment. In Hebrews 9:16, 17, the author uses the analogy of a last will and testament to show that forgiveness comes to us as heirs of Christ and that forgiveness comes to us through His blood. A. Forgiveness comes to us as heirs of Christ. To receive an inheritance, you have to be included in the will, and the person making the will must die. Those whom God calls (Heb 9:15) are the heirs. The emphasis here is not on men calling upon God, but on God’s calling of men. In other words, He is the owner of the estate, and He makes up the will, choosing the heirs. He has a specific list, not a sign-up sheet. But once the will has been drawn up, it is not put into effect until the death of the testator. We all know this principle. Ray Stedman (What More Can God Say? [G/L Regal], p. 139) tells how he was at a meeting with a group of people where the director of a Christian conference center was explaining the procedures for securing additional properties to expand the ministry. He described an arrangement that the center had with a widow, where they paid her an annuity until her death, and on her death her property would be deeded over to the conference center. One man immediately raised his hand and facetiously asked, “How healthy is she?” The question was in bad taste, but it illustrates the truth that wills are of no value to the beneficiaries until the death of the testator. So the question you need to answer is, “Have you heard God’s call in the gospel and responded with faith in Jesus’ death?” He died to inaugurate the benefits of the will for the heirs. If you are an heir of Christ through faith in His blood, you have the benefit of forgiveness that His death secured. B. Forgiveness comes only through the blood of Christ. “how much more will the blood of Christ, who through the eternal Spirit offered Himself without blemish to God, cleanse your conscience from dead works to serve the living God” (Heb 9:13, 14)! We would not associate sprinkling blood on things as cleansing them (He 9:13-note, He 9:22-note), but rather, as staining them. If you’ve ever gotten blood on a nice shirt, you know that you need to rinse it out quickly or it will permanently stain your shirt. To think of taking blood and sprinkling the book, the people, the tabernacle, and all the sacred vessels seems like it would dirty them, not cleanse them. No cell lies more than a hair’s breadth from a blood capillary, lest poisonous by-products pile up…. Through a basic chemical process of gas diffusion and transfer, individual red blood cells, traveling slowly inside narrow capillaries, simultaneously release their cargoes of fresh oxygen and absorb waste products (carbon dioxide, urea, and uric acid). The red cells deliver these potentially hazardous chemicals to organs that can dump them outside the body. He goes on to tell how the lungs and kidneys, plus the liver and spleen, work to cleanse the blood of these poisons to keep our system cleansed and healthy. Each red blood cell can only sustain the sequence of loading and unloading these chemicals for about a quarter million circuits. Then they are broken down and recycled by the liver, while the bone marrow releases new red cells to continue the process (about four million cells per second!). “The blood of animals cannot cleanse from sin because it is non-moral. The blood of sinning man cannot cleanse because it is immoral. The blood of Christ itself alone can cleanse because it is moral” (cited by W. H. Griffith Thomas, Hebrews: A Devotional Commentary [Eerdmans] pp. 117-118). The blood of Christ was shed to provide the cleansing from sin and forgiveness that we all need. Have you applied it to your soul? It is God’s only way for forgiveness of sins. A legend says that during a serious illness, the devil came into Martin Luther’s sick room, looked at him with a triumphant smile, and unrolled a big scroll, which unwound by itself. Luther read from the scroll the long, fearful record of his own sins, one by one. At first, he reeled in despair. But then, suddenly, Luther cried out, “One thing you have forgotten. The rest is all true, but one thing you left out: ‘The blood of Jesus Christ His Son cleanses us from all sin’” As Luther said this, the accuser of the brethren and his long scroll disappeared (Paul Tan, Encyclopedia of 7,700 Illustrations [Assurance Publishers], # 480). Sin has but two places where it may be; either it may be with you, so that it lies upon your neck, or upon Christ, the Lamb of God. If now it lies upon your neck, you are lost; if, how-ever, it lies upon Christ, you are free and will be saved. Take now whichever you prefer. Forgiveness of your sins comes only through the blood of Jesus Christ. Make sure that you have applied His blood to your heart by faith! Jesus, the great testator of the new covenant, did die; there is no question about that. Therefore, the will, certified by His precious blood, is valid. He has secured eternal redemption for us through His atoning death. But the Savior did not remain in the grave. After 3 days He arose, and today He lives to make sure that His will is fully carried out. His life ensures that every blessing promised by the New Testament will be given to everyone who trusts the Savior. Robby Flockheart, a street evangelist in Edinburgh, often told two stories to stress the importance of two truths—that Jesus died but also lives. In the first story, Robby told about becoming friends with a man who was later condemned to die. The prisoner called for Robby and in his presence made out his will, leaving Robby what little money he had. But on the day of the man's scheduled execution, he was pardoned. Recounting the circumstances, Robby said, "He lived, but I lost my legacy. A testament is not in force while the testator lives." In the second story, Robby told of another person who left him a small legacy. But Robby never got any of that inheritance either because, as he told it, "some rogue of a lawyer came along and I never saw a penny of it. I used to say, `If the man who left the will had been alive, he would have made sure his old friend Robby got his money.' But being dead, he had no power to see his will carried out." Jesus, the great testator of the new covenant, did die; there is no question about that. Therefore, the will, certified by His precious blood, is valid. He has secured eternal redemption for us through His atoning death. But the Savior did not remain in the grave. After three days He arose, and today He lives to make sure that His will is fully carried out. His life ensures that every blessing promised by the New Testament will be given to everyone who trusts the Savior. Only a living Savior could rescue a dying world. Wuest: for a testament is of force after men are dead, since it has no strength when the testator is living. For a covenant is valid - The readers understood the truth that for the will to be enacted the one who wrote the will had to die. Valid (949) (bebaios [word study] from baino = to go, walk, step) describes that which is fixed, stable, sure, firm, guaranteed, attested to or certified. It is something which is unwavering and persistent and thus can be relied on or depended on. It pertains to that which is known with certainty. It refers to something that has validity over a period of time (e.g., the promise made to Abraham remained valid to NT believers, see note Romans 4:16). Figuratively bebaios refers to that upon which one may build, rely or trust. Bebaios is used here in the legal sense of valid. Bebaios - 8x in 8v - Rom 4:16; 2 Cor 1:7; Heb 2:2; 3:14; 6:19; 9:17; 2 Pet 1:10, 19. NAS = certain(1), firm(2), firmly grounded(1), guaranteed(1), more sure(1), steadfast(1), unalterable(1), valid(1). In force (2480) (ischuo [word study] from is = strength + écho = have) means to be strong in body or in resources and so to be worth something, to have efficacy, to avail, have force and value. Ischuo - 28x in 28v - Matt 5:13; 8:28; 9:12; 26:40; Mark 2:17; 5:4; 9:18; 14:37; Luke 6:48; 8:43; 13:24; 14:6, 29f; 16:3; 20:26; John 21:6; Acts 6:10; 15:10; 19:16, 20; 25:7; 27:16; Gal 5:6; Phil 4:13; Heb 9:17; Jas 5:16; Rev 12:8. NAS = able(5), am… strong enough(1), been able(1), can(1), can do(1), could(8), force(1), good(1), healthy(2), means(1), overpowered(1), prevailing(1), strong enough(3), unable*(2). Made (1303) (diatithemi from dia = through or as an intensive, root meaning = "two" + tithemi = to place or put) properly means, to place apart, to set in order, to arrange. If one considers the root meaning of dia ("two"), then the definition could be rendered "to place between two" as a covenant which is something that is placed between two, an arrangement between two parties. This verb is used in the NT only in the middle voice. In secular Greek usage, diatithemi meant to arrange each in their several places, to distribute, to dispose of, arrange as one likes, to dispose of one’s property, devise it by will, to make a will, to arrange or settle mutually. The idea of placing, laying, disposing, arranging, etc, enters into the word diatithemi--as to place wares or merchandize for sale, to arrange a contract, etc. Hebrews 8:10 (note) "For this is the covenant that I will make with the house of Israel After those days, says the Lord: I will put My laws into their minds, And I will write them upon their hearts. And I will be their God, And they shall be My people. Hebrews 9:16 (note) For where a covenant is, there must of necessity be the death of the one who made it. Hebrews 9:17 (note) For a covenant is valid only when men are dead, for it is never in force while the one who made it lives. Who are the heirs of God's last will and testament? Most urgently, are you an heir? Are you listed in God's last will and testament? Does he bequeath to you the eternal inheritance? (a) The abruptness of the change, and its interruption of the line of reasoning. It is introduced into the middle of a continuous argument, in which the new covenant is compared and contrasted with the Mosaic covenant (He 8:6-10:18). (b) The turning-point, both of the analogy and of the contrast, is that both covenants were inaugurated and ratified by death: not ordinary, natural death, but sacrificial, violent death, accompanied with bloodshedding as an essential feature. Such a death is plainly indicated in ver. 15. If diatheke signifies testament, thanatos death in ver. 16 must mean natural death without bloodshed. (c) The figure of a testament would not appeal to Hebrews in connection with an inheritance. On the contrary, the idea of the kleronomia was always associated in the Hebrew mind with the inheritance of Canaan, and that inheritance with the idea of a covenant. See Deut. 4:20, 21, 22, 23; 1Chr. 16:15, 16, 17, 18; Ps. 105:8, 9, 10, 11. (d) In LXX, from which our writer habitually quotes, diatheke has universally the meaning of covenant. It occurs about 350 times, mostly representing covenant (beriyth). In the Apocryphal books it has the same sense, except in Sir. 38:33, where it signifies disposition or arrangement. Diathesthai to dispose or arrange represents karath, to cut off, hew, divide. The phrase karath beriyth (to make) a covenant, is very common. The verb marks a disposing by the divine will, to which man becomes a party by assent; while suntithesthai indicates an arrangement between two equal parties. There is not a trace of the meaning testament in the Greek O. T. In the classics diatheke is usually testament. Philo uses the word in the sense of covenant, but also shows how it acquired that of testament (De Mutatione Nominum, § 6 ff.). The Vulgate has testamentum, even where the sense of covenant is indisputable. See Ex. 30:26; Num. 14:44; 2Ki6:15; Jer. 3:16; Mal. 3:1; Lk 1:72; Acts 3:25; 7:8. Also in NT quotations from the OT, where, in its translation of the OT, it uses foedus. See Jer. 31:31, cit. Heb. 8:8. For diatithesthai of making a covenant, see Heb. 8:10; Acts 3:25; Heb. 10:16. (e) The ratification of a covenant by the sacrifice of a victim is attested by Gen. 15:10; Ps. 50:5; Jer. 34:18. This is suggested also by the phrase karath beriyth to cut a covenant, which finds abundant analogy in both Greek and “Latin. Thus we have horkia tamnein to cut oaths, that is, to sacrifice a victim in attestation (Hom. Il. ii. 124; Od. xxiv. 483: Hdt. vii. 132). Similarly, spondas temomen let us cut (make) a league (Eurip. Hel. 1235): philia temnesthai to cement friendship by sacrificing a victim; lit. to cut friendship (Eurip. Suppl. 375). In Latin, foedus ferire to strike a league: foedus ictum a ratified league, ratified by a blow (ictus). (f) If testament is the correct translation in vv. 16, 17, the writer is fairly chargeable with a rhetorical blunder; for ver. 18 ff. is plainly intended as a historical illustration of the propositions in vv. 16, 17, and the illustration turns on a point entirely different from the matter illustrated. The writer is made to say, “A will is of no force until after the testator’s death; therefore the first covenant was ratified with the blood of victims. (Vincent, M. R. Word Studies in the New Testament 4:494-495). Spurgeon on it is never in force while the one who made it lives - Until the blood of Jesus had been shed, the covenant was not signed, and sealed, and ratified. It was like a will that could only become valid by the death of the testator. It is true that there was such perfect unity of heart between the Father and the Son, and such mutual foreknowledge that the covenant would be ratified in due time, that multitudes of the chosen ones were welcomed to heaven in anticipation of the redemption that would actually be accomplished by Christ upon the cross. But when Jesus took upon Himself the likeness of men, and in our human nature suffered and died upon the accursed tree, He did, as it were, write His name in crimson characters upon the eternal covenant, and thus sealed it with His blood. It is because the blood of Jesus is the seal of this covenant that it has such power to bless us, and is the means of lifting us up out of the prison pit where there is no water.